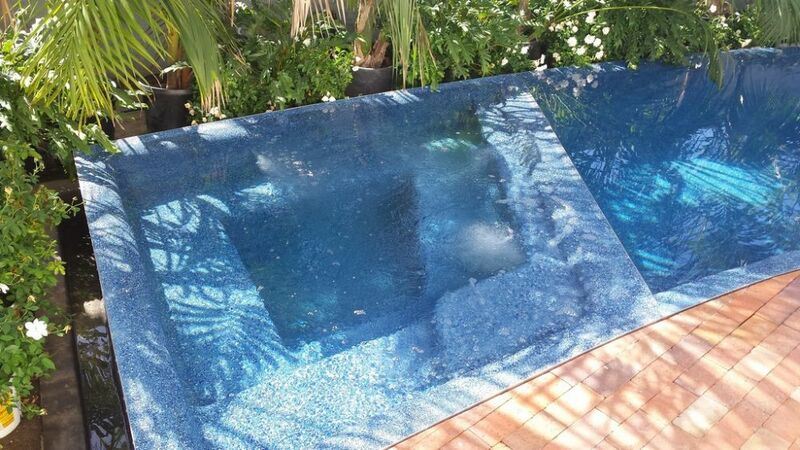 Faced with the challenge of fitting a lap pool into a relatively compact backyard space, Randy Beard used geometry to his advantage in crafting a perimeter-overflow/vanishing-edge pool and spa that aligns sweepingly with the homeowners' needs. These days, we do most of our work in the hills in and around Newport Beach, Calif. To describe the area as “affluent” is understating the case: For years now, even modest homes for sale in the area usually draw seven-figure prices – and the more modest the home, the likelier it is that it will be torn down and replaced with something larger and more elaborate. 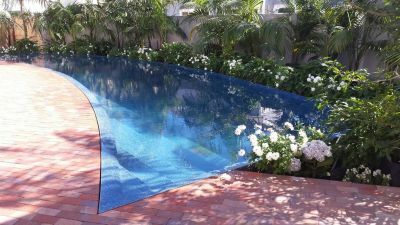 Through the past few years, we at Pure Water Pools of Costa Mesa, Calif., have been called to many of these built-out properties by homeowners who are getting around to redoing their backyards: They’re finished tinkering with the house, they tell us, and now they want an exterior environment that extends from and harmonizes with their interior spaces. The project described in this article took place at one of these homes, but there was a difference: It had been built by combining two lots, so even with a substantial home on the property, the backyard space was unusually large – big enough, in fact, to allow for lap swimming. It was also immediately clear that the homeowners had done a lot of thinking about what they wanted, so our main task was one of taking their vision and delivering a work of art befitting a beautiful Cape Cod-style house. The property is set in a relatively flat area at the end of the Newport Peninsula, pinned between the Pacific Ocean and Newport Harbor – a wonderful place to be, but one that in this case came without views of anything other than neighbors’ rooflines and some trees. 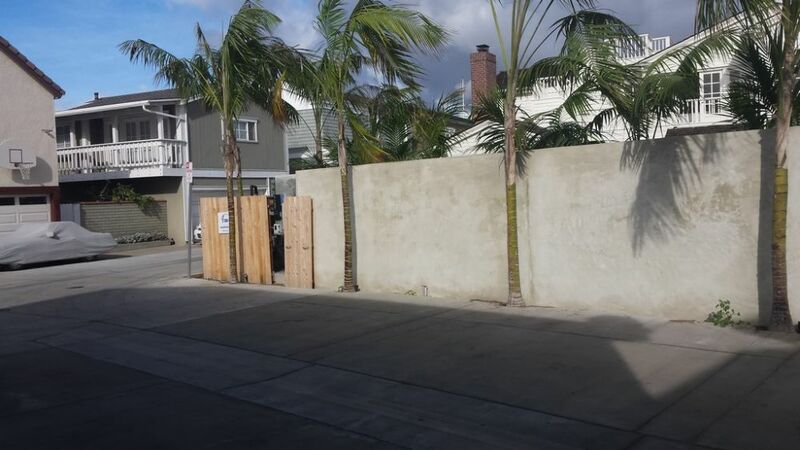 It is also situated in an area where parking for construction crews can be a nightmare during the summer, which happened to be our window for getting things done. We were truly fortunate that the property was backed by alleys on two sides: This gave us great access to the site and also gave us room to park our vehicles and stage construction activities. The arc of the pool (and the spa at its far end) takes full advantage of the backyard’s available space, starting in a corner on the side of the house and wrapping much of the way across the back – enough of a span that we were able to include an adequate lane for lap swimming. The family is from Sweden and spends the prime summer months in their home there. This put us on site from July through September, and other than an adult son who stayed behind for one of our three months, they were gone for the duration. Just the same, they were able to keep close tabs on what was happening: We frequently set up stop-action cameras these days to maintain site security and record our projects’ progress; in this case, we gave the absent homeowners access to our camera feed while they were in Sweden so they could see how things were taking shape 5,500 miles away. We recycled the original brick of the deck, freshening up the area under the patio cover and preserving a large, open expanse for lounging in the sun. 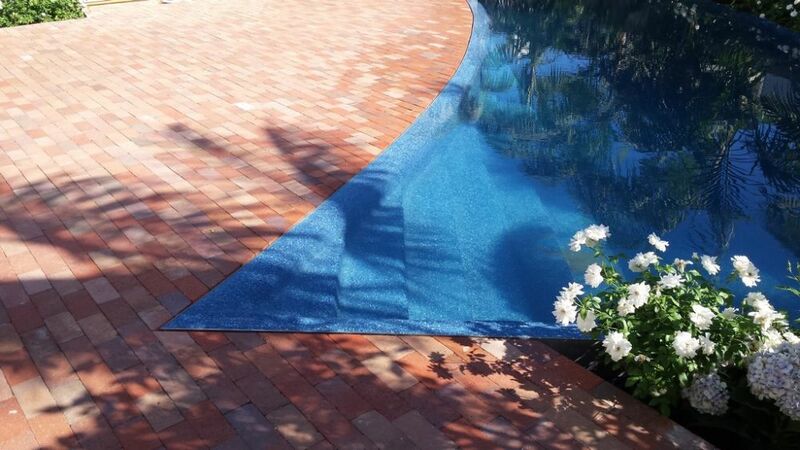 To mark the transition from the deck to the pool with a sharp, formal touch, we wrapped the watershape’s entire perimeter in stainless steel and painstakingly trimmed the bricks to fit. To maximize use of the space, we set the pool up as a long, sweeping arc with a spa tucked in at the far end along the side of the house. 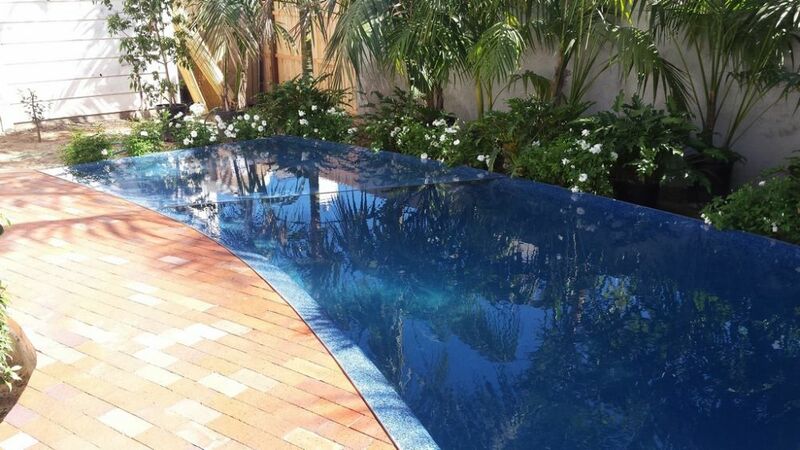 The shape and positioning gives the impression that the pool is not particularly large, but there’s actually enough distance between the diagonal corners that there’s a straight swimming lane of adequate length. Before we started, much of the backyard had been covered in sand-set brick; we took up the old decking and later reused it to compose the surfaces surrounding the perimeter-overflow edge close to the home. To make the lines as sharp and formal-looking as possible, we bolted in a stainless steel weir around the shell’s entire perimeter, including the vanishing edge on the far side of the pool. 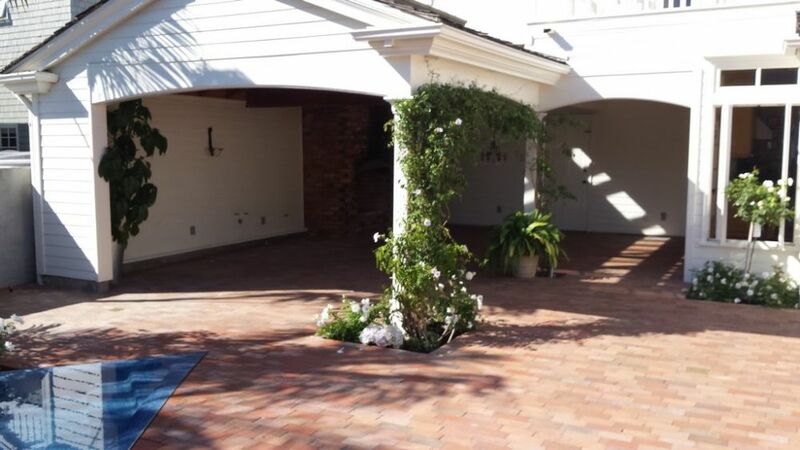 Although the property is close to both the beach and the harbor, the backyard offers no water views. We moved past this shortcoming by enhancing the close-in views wherever we could, placing a variety of plants around the backyard (including several specimen palms planted beyond the wall) to soften the hardscape and edges and take advantage of the brilliantly reflective water surface. Within that steel frame, we set up a John Lautner-style rolled-edge detail, where the tops of the walls arch up to all of the edges. It’s a great look borrowed from a master architect – something the homeowners had seen somewhere and had suggested using. We took to the idea immediately because the softly curving planes did a nice job of echoing the long, sweeping arc of the pool. The spa and pool take up a lot of the available space, but by using the side yard we preserved a considerable expanse of decking immediately outside the home’s covered patio and French doors, all of which open up and offer an easy flow between the interior and exterior spaces. I wouldn’t say that the family is big on entertaining, but the space is large enough that, when the project was complete, they invited the people in our company to a catered party attended by more than 30 people. The clients helped us set the tone throughout the project. They knew they wanted the Lautner edge, which made developing the full-perimeter water-in-transit system a natural; they knew they wanted BeadCrete (from Pebble Technology, Scottsdale, Ariz.) inside the pool and spa, and that they also wanted to recycle the brick. Perhaps most strongly of all, they knew they wanted to maintain the pool using as few chemicals as possible. As you’ll see, the system we use – that is, Pool Studio by Structure Studios of Henderson, Nev. – was capable of easing us through several detailed iterations of the project as it evolved from a basic shape to become a full-featured and unusual gem of a lap pool. 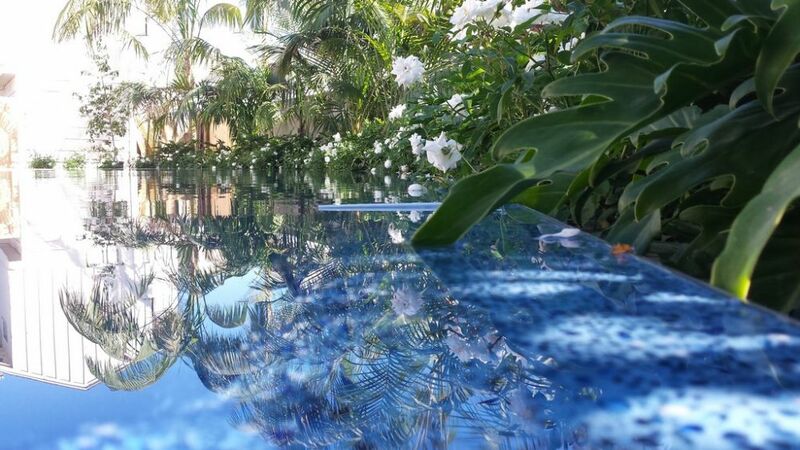 We also brought in a large number of specimen palms and an array of white-flowered plants to soften the edges and work with the pool’s beautifully reflective surface. 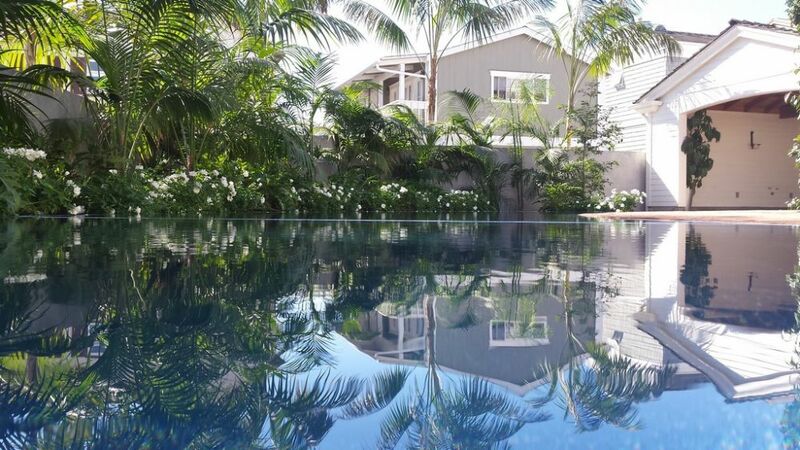 Where we had space available, we planted palms just outside the boundary walls, creating both a “borrowed” view and more great reflections that wouldn’t have been available any other way. What we enjoyed most about this project (beyond the wonderful clients and a great wrap party) was the fact that it is an elegant concept that emerged from a distinct set of client desires. 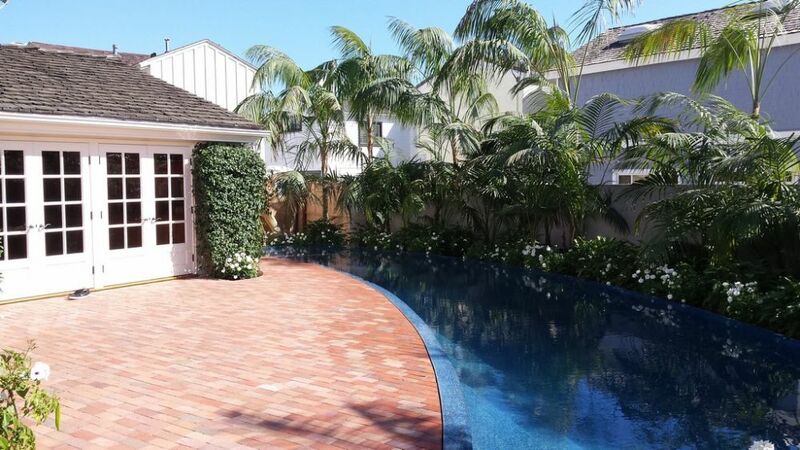 It’s rare to be able to deliver a lap pool to a backyard in Newport Beach: In this instance, everything came together – and our clients helped us hit it out of the park.